The Images of America series of books has a great book called "Boston's Red Line - Bridging the Charles from Alewife to Braintree".At the top of page 25, there is a shot of the Eliot Square rapid-transit shop yard. About two-thirds of the way up the photo, there is a concrete wall that separates the yard from Boylston (now JFK) Street. There are five or six massive doors in the wall that can be slid aside to allow passengers to enter from the sidewalks. On the yard side of each door there are two sets of stairs that lead down to the boarding platform. That was Stadium Station. These were installed in vintage rapid transit cars of their respective periods, usually by the doors, and were found to be an easier way to determine stops than maps, which is why newer versions are used to this day on modern equipment. Fascinating Mr. Joyce, thank you for sharing. I have been searching for years for a sign like that. I live close to Orient Heights. My hope was to find one at a yard sale. Now i know I will have to look even harder. 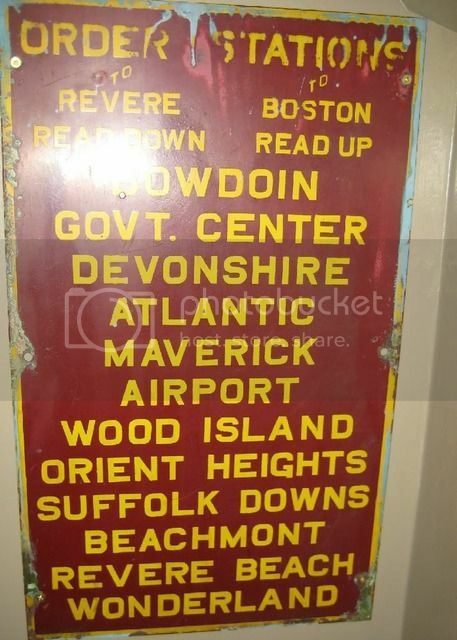 If this Transit Map were to be updated, I think the following station drawings would still be accurate: Capen Street, Valley Road, Central Avenue, Milton, Cedar Grove, Shawmut, Savin Hill, Andrew, Broadway, Kendall, Central, Boylston/Essex, State/Milk/Devonshire, Maverick, Orient Heights, Suffolk Downs, Beachmont, Revere Beach, Wonderland, Symphony, Mechanics, Kenmore, Massachusetts, Copley, Arlington, Boylston Street, and Lechmere. The others no longer exist or have been substantially rebuilt. Adams_Umass_Boston wrote: Fascinating Mr. Joyce, thank you for sharing. I have been searching for years for a sign like that. I live close to Orient Heights. My hope was to find one at a yard sale. Now i know I will have to look even harder. You're welcome. I wished that you had gotten to me earlier- I would have given you one. I had a few and I gave them away. I recently saw a nice one on Ebay. It looked like someone had gotten it when it was on the original green interior paint. There were a few grey Pullmans that were never re-painted inside or out. Finding items like these at regular yard type sales is great but rare. I have had my best luck at small shows, where you have a friendly crowd and modest prices. You could put a year-long search for one on Ebay and they will notify you if one shows up. There is one that I'm looking for. I don't even know if it exists, and that's one that shows the Atlantic Avenue Elevated Stations. Unfortunately, most trolleys, unlike the original ones, were used throughout the system, so they were never signed permanently. The best you can hope for is a rollsign. Going way back, you would find dash and roof signs that rotated. There are still bargains to be had, and collections are being released for sale from estates all the time. 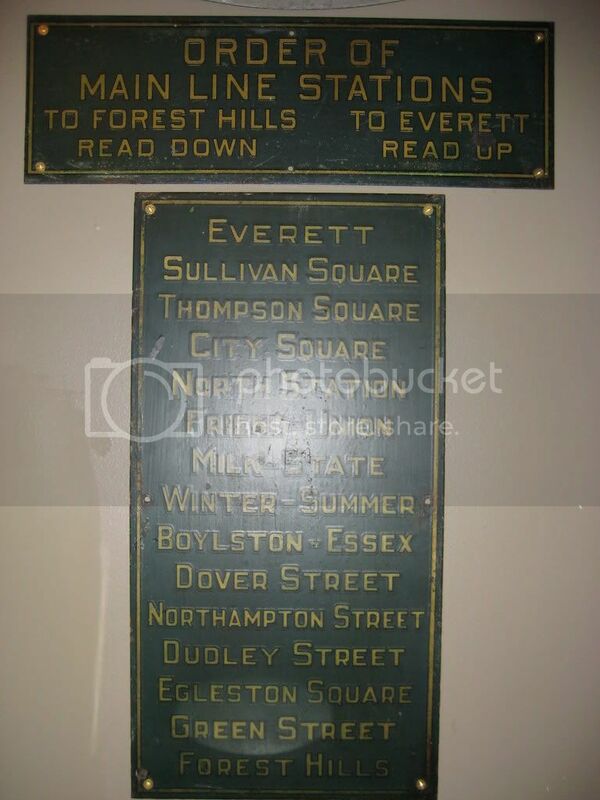 I have a Quincy dash sign that I picked up up in North Conway NH at a railway flea market for $4. A "Danger-Third Rail Alive" sits above my train layout. It's quite fitting as I run 3-rail "O". I picked it up for less than $10 at one of the BSRA auctions. Check around, visit the shows, and watch Ebay is my advice. 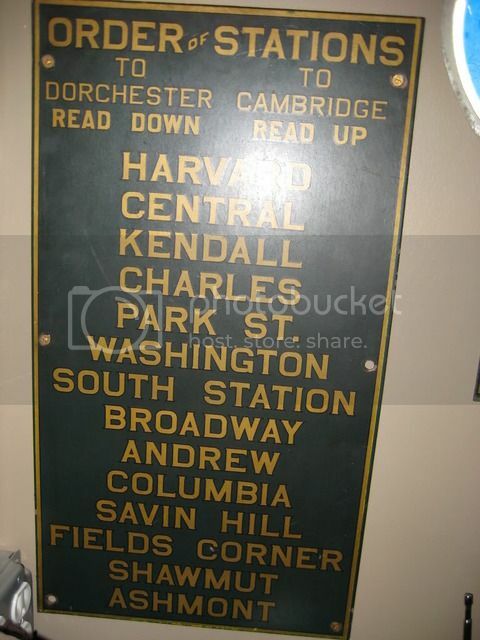 I have had a few PM inquiries about whether the MBTA has stuff like this hanging around. The answer is no. I've come to meet a lot of buffs that work for the T and nothing interesting stays in a dumpster for long ! Happy hunting ! I love to look everywhere. I often find myself at estateS picking up donations of books for our Library. I always keep any eye out for anything like that. Last year I went to a block party over on the next street. There is a home there that was once the Harbor View Station on the old EBRL. They even have the wooden sign in there home. I was so jealous! On the 1954 (or whatever) map, I like how it says Sq at City Square Station. The 'City' is mysteriously missing. 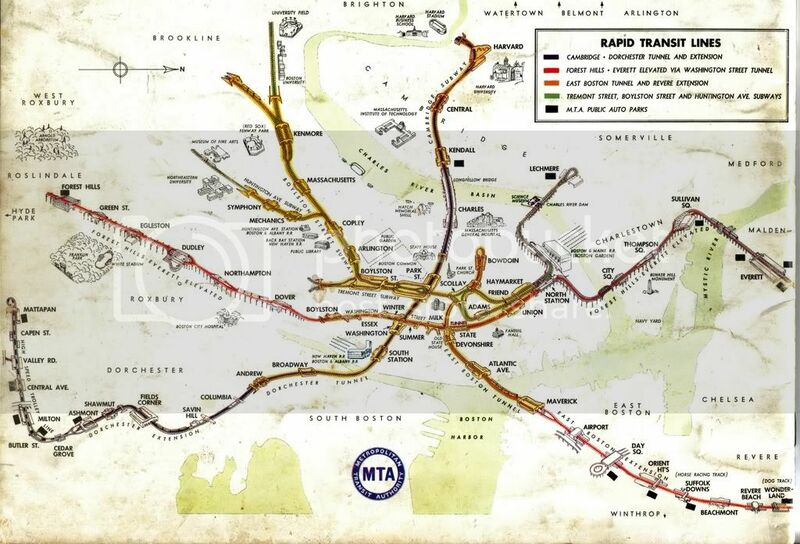 Fred Rabin wrote: If this Transit Map were to be updated, I think the following station drawings would still be accurate: Capen Street, Valley Road, Central Avenue, Milton, Cedar Grove, Shawmut, Savin Hill, Andrew, Broadway, Kendall, Central, Boylston/Essex, State/Milk/Devonshire, Maverick, Orient Heights, Suffolk Downs, Beachmont, Revere Beach, Wonderland, Symphony, Mechanics, Kenmore, Massachusetts, Copley, Arlington, Boylston Street, and Lechmere. The others no longer exist or have been substantially rebuilt. Weren't Kendall and Central extended for six car trains in the early 80's? I know Kendall's north (outbound) end is clearly not original, when the new headhouses were built. Most of the Red Line stations were extended but this alone would not affect the drawings (which are not to scale). DCmetrogreen wrote: On the 1954 (or whatever) map, I like how it says Sq at City Square Station. The 'City' is mysteriously missing. That one is a copy of the original. Well, here's a surprise, thanks to Leo Sullivan. This is a 1945 Metropolitan Transit Recess Commission (early MTA ?) map of proposed extensions of the rapid transit system. The Boston Elevated Railway Company was still running the system and the Metropolitan Transit Authority was two and four years away from taking over, legally and operationally, respectively. This is truely an amazing document as it shows the insight and vision that saw that this expansion might be possible, which in fact, actually did come to fruition decades later in many cases. Of personal interest to myself was the fact that this map confirmed my earlier suspicions voiced on this forum, that it was my belief that plans had been made to extend southerly beyond Forest Hills on the Main Line. In fact, as I suggested, we can see that the tracks would have crossed the New Haven Railroad's Boston-Providence Main Line diagnolly, entering Roslindale Square and then running along the New Haven's Dedham Branch through West Roxbury into Dedham. While Boston & Albany steam locomotives were hissing down the very same right-of-way, fourteen years before completion of the Highland Branch, they had it down precisely, with an added southerly jog into Needham Junction after Newton Highlands. Additionally, their Highland Branch connected with a loop that went through the Newtonville area, eventually entering the Pleasant Street Portal and entering the Central Subway System. The Red Line goes to Arlington Heights via Watertown and Belmont, on it's west leg, and Braintree on it's east leg. Braintree would come to pass thirty-five years later ! In the news as I write this, a proposed extension beyond Lechmere goes not only through Somerville and Medford, but through Winchester as well, all the way to Woburn ! The northern leg of the Main Line goes way beyond it's current terminal area to Reading. It looks like the planners of 1945 envisioned the current Orange Line plus, with either Everett maintained as a repair facility stub, or kept as a possible point of future expansion. The East Boston/Revere Extension shows a ride along the old narrow gauge Boston, Revere Beach & Lynn right-of-way into Lynn, another proposed expansion as current today as back then. I can't help but be in awe of the excellent system that this would have become, a system that appears to be at least double it's current size. Was this the MTA's vision of what was to come ? What here can you see as a "to be named" future extension ? It seems apparent that a good deal of construction making up this plan would be opposed on the grounds of "neighborhood blight" as well as other issues, but one can not help but to look at other larger systems and wonder why if it has been done elsewhere, it could not be done here. More subways than indicated, perhaps ? Well, anyway, if you see this map as the product of a big budgeted commissioned study twenty years from now, remember that the MTA did it in 1945 ! ^A very nice picture of a beautiful map. Do you have a larger version of this map? I would love to be able to zoom in so I can read the stations and have a closer look at the track layout. 3rdrail wrote: The link is expandable. 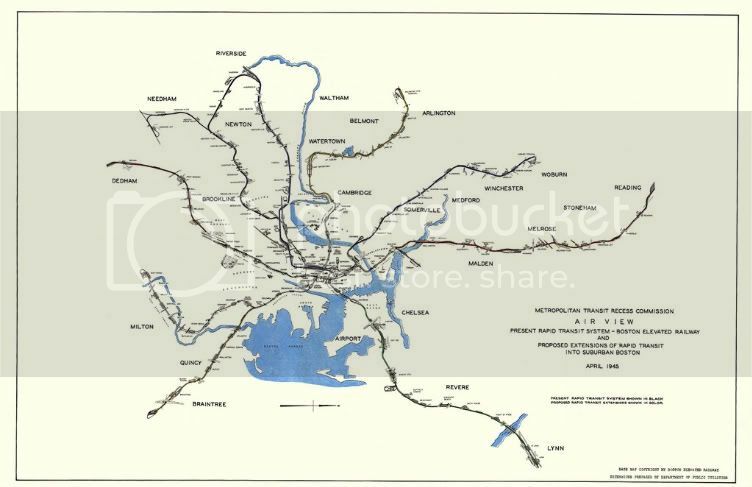 Yes the link works, but I was wondering if you have a larger version of this map so I can zoom in to see the station names, and have a closer look at the track layout. Copy it, send it to your pictures, and blow it up with your computer software.